Captives release a second single and announce album tour dates!! Captives‘ new album will take you “Over The Rainbow”! Their new album is out next Friday, 30th March 2018 so they are celebrating today with a new single and raucous house party video. The record is available now to pre-order – all information about digital pre-orders and physical pre-order bundles available at captives.com.au. 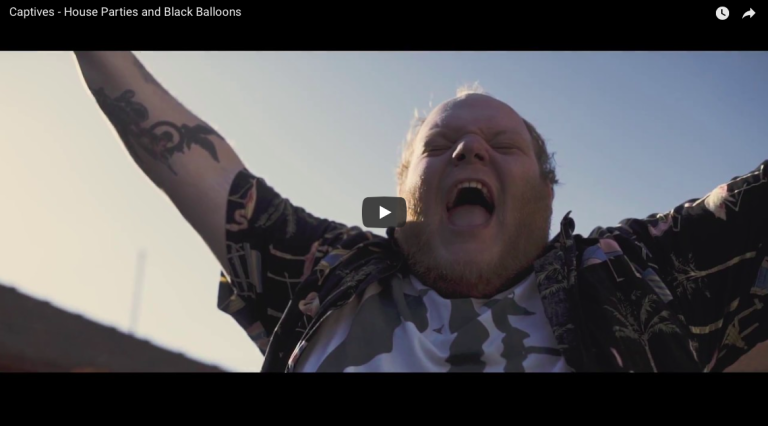 The new single and video, “House Parties and Black Balloons”, is also out now, having premiered at Heavy Magazine today! A Backyard Party ensues in the Filmclip – and Captives are at the centre of the mayhem! They are also heading out on their official album release tour – see dates below. Captives once again worked with Tom Larkin (Producer) and Samuel K Sproull (Mixing Engineer) in the now-Homesurgery Recordings Studios (nee Studios in the City.) for Over the Rainbow! Newer PostCaptives debut album release day!!! Older PostCircles signs to Wild Thing Records (AUS/NZ) , Season Of Mist (EU,UK,US) and tease a brand new track!